Care for some water in your butter? As you know, I have a serious obsession with turning raw milk into all sort of fascinating things. A jar of white liquid turning into a delicious, golden-yellow solid. It’s darn close to being miraculous if you ask me. I officially ditched margarine several years ago, and it’s no longer allowed across the threshold in my home. I’m really glad that more and more folks are starting to understand the health benefits of real butter and healthy fats, because eating yellow-colored wanna-be-butter out of a tub is a travesty. 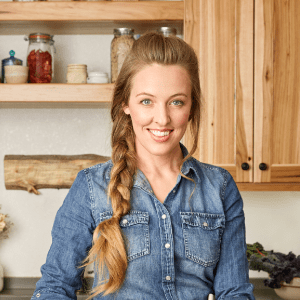 Thankfully, you can totally learn how to make butter at home, even if you don’t keep your own dairy animals. 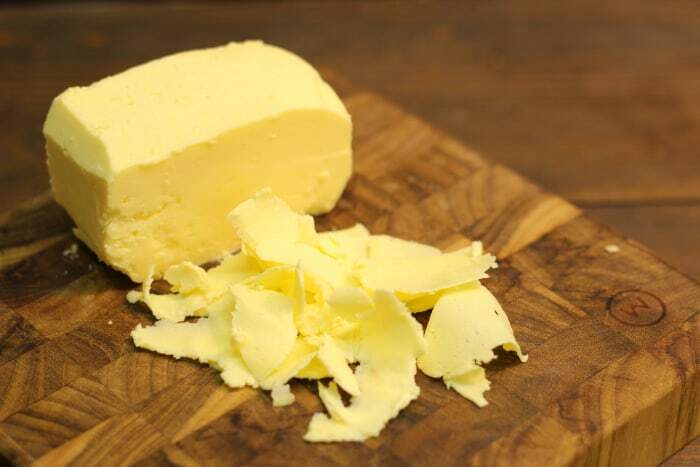 There are two main varieties of butter: sweet cream and cultured. 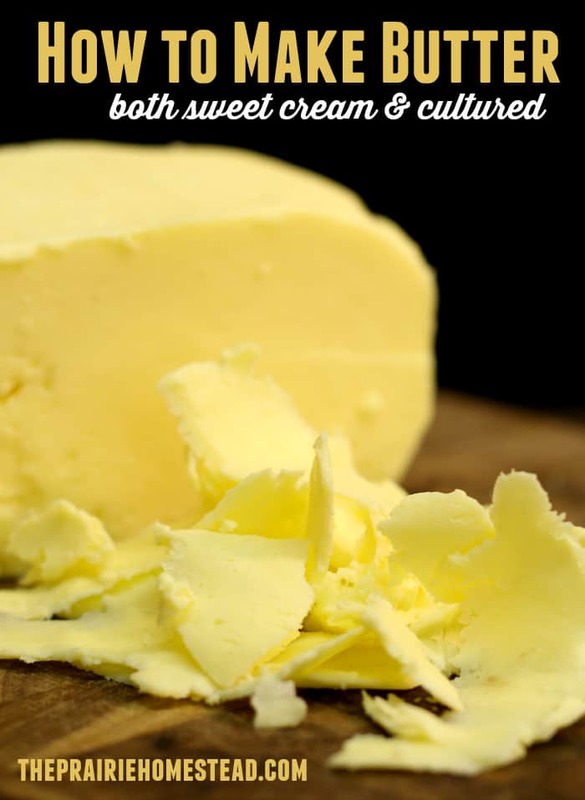 Sweet cream butter is simply butter made from fresh cream. 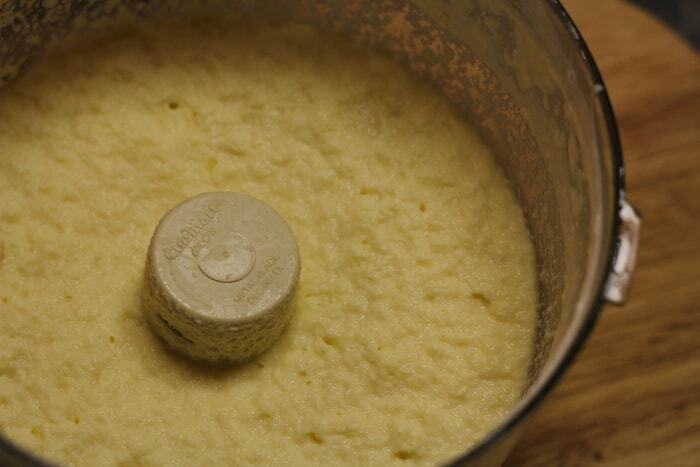 This is the slightly easier option–although cultured butter really isn’t that much harder. If you use raw cream (here’s why we personally believe raw dairy products are healthier for our family), then the butter ends up not only being a scrumptious vehicle for ingesting healthy fats, but it also contains all the good bacteria and enzymes from the raw milk too. Win win. As you know, I’m a huge fan of raw dairy, so naturally, I’m going to use raw cream for my butter whenever possible. However, if you don’t have access to raw milk, you can learn how to make butter from pasteurized cream instead. Just try to select regular pasteurized cream if you can–avoid ultra-pasteurized (UHT) cream, since it has been heated severely, ruining much of the flavor. If it’s your only option, it’s doable, but not optimal. Regular pasteurized cream, or vat-pasteurized cream, will suit you better if you can find it. You don’t have to have any sort of special equipment to make butter–cream can be transformed simply by putting it in a mason jar with a lid and shaking the dickens out of it. If you plan on making butter on a regular basis AND you want to maintain your sanity, you definitely want to use some sort of kitchen appliance to help you out. My weapon of choice is a food processor. I have this one, and I like it because I haven’t been able to kill it yet… I had a cheaper model for a while, but it died… Death by butter-making. Yeah, it was brutal. Other options are a stand mixer (I have this one and adore it) or even a blender. My biggest beef with my stand mixer is that it has the tendency to fling cream all over my kitchen when I make butter… So you may want to cover it with a towel or a piece of plastic wrap. There are plenty of different styles of butter churns available as well, including electric models. But due to the space constraints in my tiny kitchen, I have to have appliances that serve more than one purpose. And my food processor fits the bill. Pull the cream out of the fridge a couple hours before you plan on making butter. Room temperature cream seems to turn into butter much faster for me than cold cream. Place the cream into the processor or blender and turn it on. It’s important not to fill it past the “full” line. Otherwise, it’ll slosh and you’ll have a huge mess. Trust me, I pushed the limits of the full line once, and the full line won. The cream will go through several different stages before finally turning into butter. And then it turns into whipped cream. And then into chunky whipped cream. And finally, it will “break.” This is when the yellow butterfat separates from the buttermilk. It looks like this. Strain the buttermilk from the butterfat, and save it back for making delicious pancakes, waffles, or buttermilk biscuits. You now need to wash the butter to remove as much of the buttermilk as possible–this will help it to not spoil as quickly. 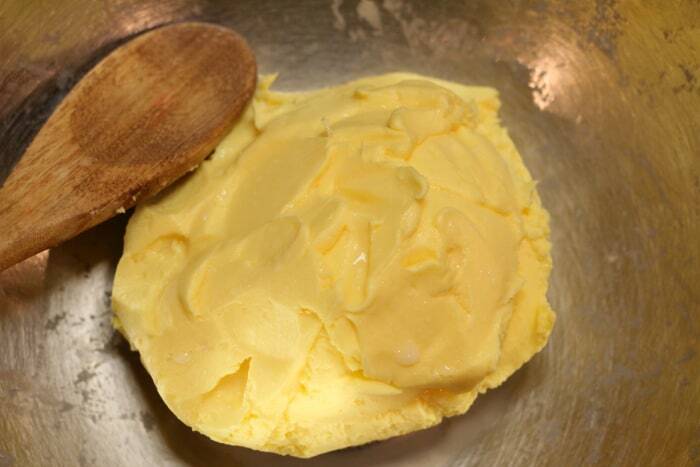 Use a wooden spoon to gently press the butter particles together and encourage them to stick together. As the butter gets colder, it will firm up. Dump off the cloudy water, and add fresh. Continue to knead and press the butter to remove more and more buttermilk. Mix in salt, to taste, if desired. This process is almost identical to the sweet cream butter process, BUT we are going to culture the cream first. Cultured cream will have even more probiotic goodness in it, plus many folks prefer its richer depth of flavor. 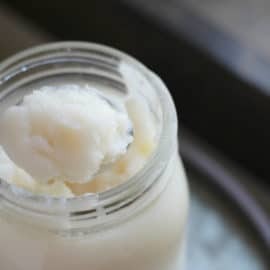 For raw cream: If you have raw cream, you don’t actually even need a starter culture. The raw milk contains all the good bacteria it needs to culture on its own–it just requires a bit of time. If you leave it on the counter for a 24-48 hours, you’ll find that the raw cream has thickened and developed a pleasantly sour smell. It’s ready to go. However, I actually like to use a bit of starter culture even when I’m using raw cream, since I like the consistent flavor it produces. For pasteurized cream: If you are using pasteurized cream, you must add some sort of starter culture, since the beneficial bacteria were killed when the cream was heated. I use a bit of mesophilic culture to culture my cream before making it into butter. Other culturing options would be buttermilk culture, or even yogurt, sour cream, or cultured buttermilk, as long as they contain live, active cultures. Sprinkle the culture on top of the cream and gently stir in. 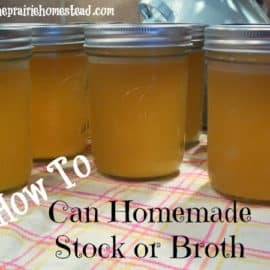 Cover it with a breathable lid (like a paper towel or cloth napkin) and allow it to ferment at room temperature for 24 hours, or until the cream is thickened and pleasantly tangy and sour smelling. Proceed to turn your cultured cream into lovely cultured butter by following the directions for sweet cream butter above. Your gorgeous homemade butter can be enjoyed fresh, placed in an airtight container in the fridge for a few days, or wrapped tightly and frozen. Sometimes I use my antique butter mold to form a brick, but usually it’s easier to just plop it on a piece of plastic wrap, and form a log shape. Not as charming as butter from a cute little mold like this, but it tastes just as good. 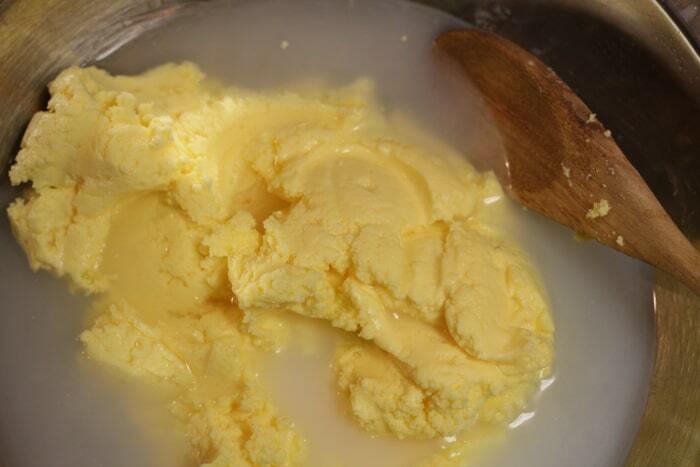 Wash the butter in ice cold water, pressing it together with a wooden spoon to remove buttermilk. Rinse, and repeat until the water is no longer cloudy with buttermilk. Store in the fridge for several days, or in the freezer for long term storage. Thank you for this post! I can’t wait to make my own butter. 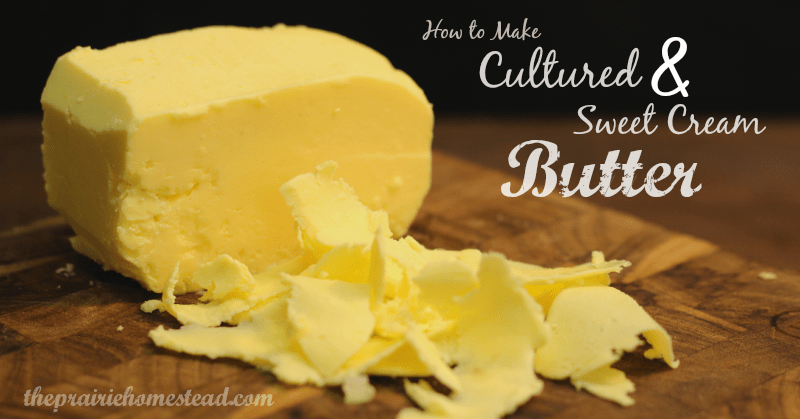 My question: do you have to keep your cultured butter in the fridge? We leave our kerrygold butter in a glass dish on our counter. If it’s cultured it doesn’t need refrigeration. I keep some in a butter dish on the counter. since its home made butter I don’t think you have to refrigerate but I would just leave it on the counter because butter doesn’t get spoiled you know what I’m saying like its producing in its own way on the counter. I am culturing cream to make cultured butter. I used my homemade yogurt to culture it. Now the cream smells yeasty and so does my new batch of yogurt. Sounds like I made french bread at the same time as yogurt. Can we still eat the yeasty yogurt and butter ? How much salt do I add? I don’t want it too salty. Also, when using heavy whipping cream will the butter turn yellow likecwhen using raw cows milk? We make a lot, like pounds, of cultured butter every week. We usually use about a teaspoon of salt to every quart of cream. I have a pretty big food processor and it will do about a quart at a time. You won’t get the same yellow color from heavy whipping cream, and I have extremely different shades of yellow from my own cow. It all depends on what they are eating and the time of year. My favorite butter is spring time, flush of green growth butter. It is full of beta carotene, making it yellow, and always very firm. I put flaky sea salt in mine so you have a tiny little burst of salt when you spred it over your toast, and or I add garlic and Basel for an awesome garlic bread.. with the buttermilk I make pancakes or other baking that requires milk.. Does anyone know if I can culture raw cow cream that has been frozen? If I thaw it out in the frig can I then culture it and make butter, or should I just go right to making sweet cream butter? I got a butter churn for Christmas and tried to make it with half and half but after 2 hours of churning,(when churner said about 20 minutes) I decided to call it quits. So I tried can cream (evaporated milk, not even sure what that is)but that didn’t work either. I was thinking that I would need to get raw milk from a cow, unfortunately don’t own a cow or know anyone that does so I was very excited to see that you said whipping cream would work. Going to store tomorrow and will be trying that. Thanks. How much does this make approximately? I’m making cupcakes this weekend and it would be DANDY to have homemade butter to put in them! It depends on the cream, but I believe a quart will make roughly 3/4 to 1 pound. How did the butter get so yellow? 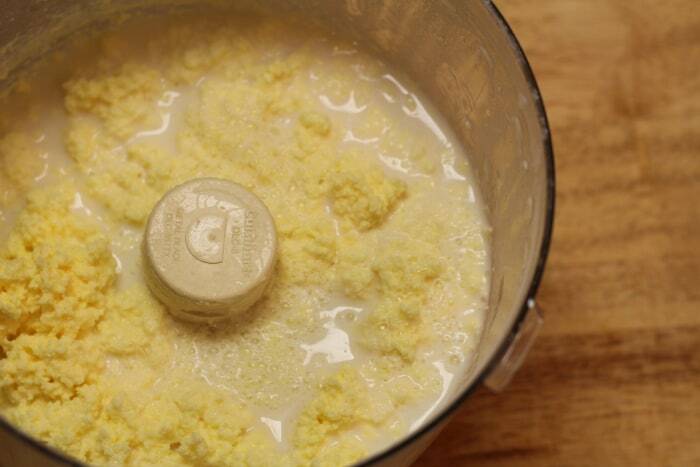 I make butter from goats milk, and it is never that yellow…..just curious. cause my real butter doesn’t need to be yellow. I have goats too and make butter 🙂 The difference in color when using cream from goats versus cows has to do with how they process beta carotene. My butter is nearly white. Is there a big taste difference in butter made from cows vs. goats? It depends on the breed of cow, the time of year, and what she has been eating. Ours is a Brown Swiss/Guernsey cross, and even her milk is a golden color. Also, butter made from cows grazing fresh spring grass will be even more yellow. I haven’t ever made goat butter, but considering how the fat is different it in, it might not be yellow by nature? Here is my problem – getting that much raw cream. I can buy half gallons of raw milk and try to lift off enough cream, but then I am left with a lot of “skimmed” milk. make mozzarella, and with the liquid that is left, make ricotta, or even better, gjetost caramelized cheese. I’d love to hear an efficient way for skimming the cream off the milk…? I can get raw milk, but getting the cream off it is a tedious process. I must not be doing it right. I use a turkey baster. Some people put the milk in a bowl and skim it off the top with a spoon or ladle. Would straining it through cheese cloth work? If you get one of those glass countertop ice tea dispensers with the tap near the bottom, that works great. I got one for $10 at Bed Bath & Beyond. 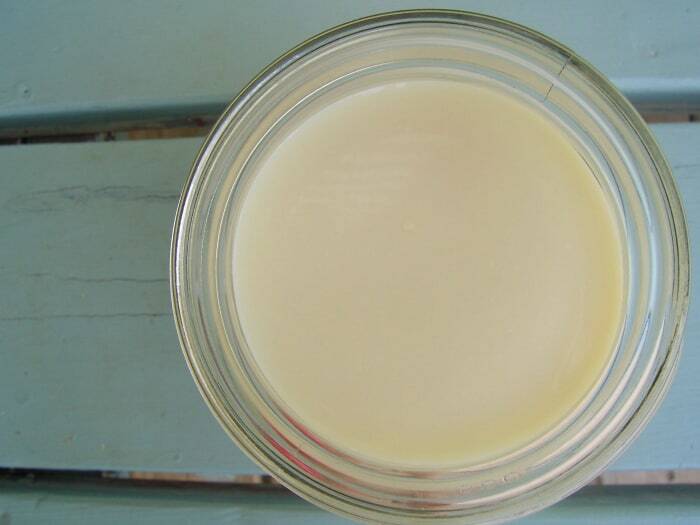 Pour your raw milk in the container and the fat will rise to the top. Then just open the tap at the bottom and drain off the “skimmed” milk. What’s left in the container is the cream. I lived on a dairy farm and used to have an old fashioned gallon thermos jug. 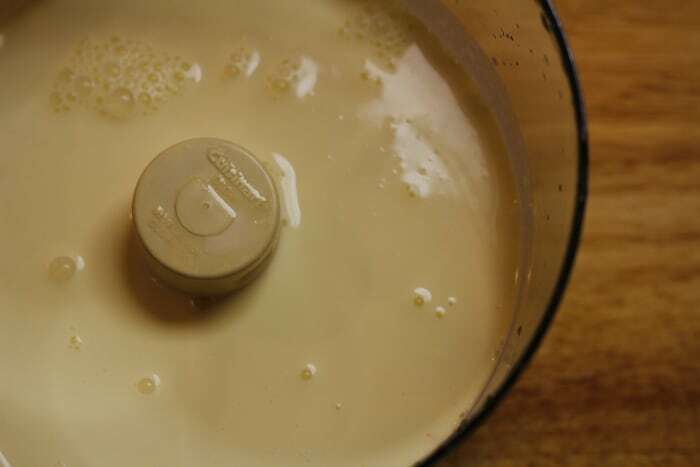 I would go and dip a jug of milk out and let it sit for a while to let it separate, then I would take a gravy ladle and just scoop the cream off the top. I would use it for whipped cream and butter. LOVED it!!! 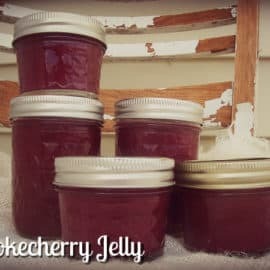 My boys were young then and I would put the cream in a mason jar and set them on the floor and let them roll the jar back and forth to each other till it was butter. It was a game to them and a help to me because they were making the butter!! Thanks so much for this! I just made some and it came out great!!! 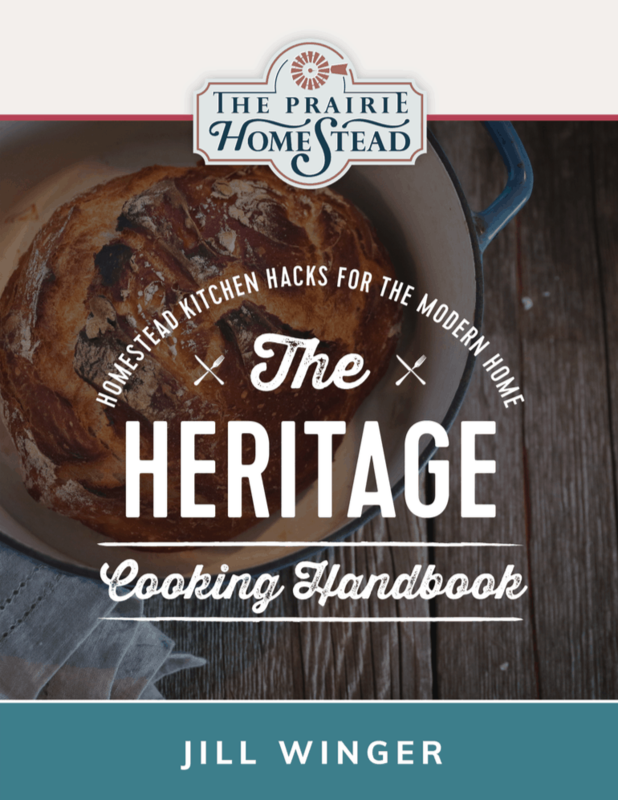 Amen to the homesteader’s heaven!!! 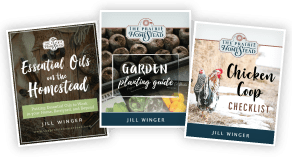 We are still working our way out of suburban living but I have been growing in my rural homesteading skills for a few years. There’s nothing better than homemade butter from fresh cream on homemade bread. But since we get only a little cream from our milk supply I tend to be somewhat protective of the golden butter treasure. =0). Question for you, since you are another one who marvels at the wonder of milk’s ability to transform into many delights (an age old shape shifter! ), I was attempting to make a batch of yogurt last week without my yogurt maker (long story but want to perfect a no electricity method) and I made some form of cheese instead (obviously kept the insulated cooler too warm). If the components were simply milk and some Greek yogurt as the starter, what would I have made? It looked almost like cottage cheese or some kind of cream cheese but I did NOT like the final taste (though it may have soured more as I failed to drain it all the way of whey). Thoughts? Thanks! Hmmm… I’m not exactly sure why that would have happened. Are you certain that the greek yogurt contained live active cultures? Pretty sure. I have used that brand before with awesome results but that was when I just used a yogurt maker. This time I heated the milk somewhat, added my culture when cooled to the touch, and out the quart jars into a cooler. I wrapped then with a towel and then put a jar of boiling water in to help keep everything warm throughout the night. The next morning I had jars of cheesy stuff and lots of whey, not very yogurt-like at all. To make countertop yogurt, you need to heat your milk to at least 180 degrees, cool it until it’s comfortable to the touch, then add in a sufficient amount of your starter yogurt. Pour this mixture into your jar, wrap in a towel, and set on the counter for 10-12 hours. For a thicker, tangier yogurt, scald the milk before cooling it. Of course, you can always strain with cheesecloth if you want a dense, Greek-type yogurt. Butter! It needs its own place as a Food Group. The way the cream turns all of a sudden to yellow butter chunks is fascinating! Where does the yellow come from (kind of like where does the white in the snow go when it melts)? Actually, what I want to know is…when my (raw) cream sits too long in the fridge, it gets an almost “rancid” taste to it, which the butter retains. My grandma used to made butter and I remember it tasting like that, also. Is that taste that I consider “rancid” not really rancid, but actually cultured? Is it just my taste buds (and those of my children) rebelling??? If it was actually rancid, you would get sick eating it. Is this like the Kerry Gold butter you can buy at the store? That’s what it sounds and looks like. It’s called butter but if you’ve had it you know it’s not the same as a regular stick of butter! Yeah–I’ve never done great with a blender either… But some folks swear by it. Enjoy that butter! I can’t wait to get home and try this! How long does the mixing part take? Are we talking just a few minutes or like 20 min of mixing? Also what speed do you normally use, a slower speed or faster or somewhere in the middle? It can take anywhere from 5 minutes to 20, depending on what machine you are using, the cream, and the temperature of the cream. I usually do fast speed. 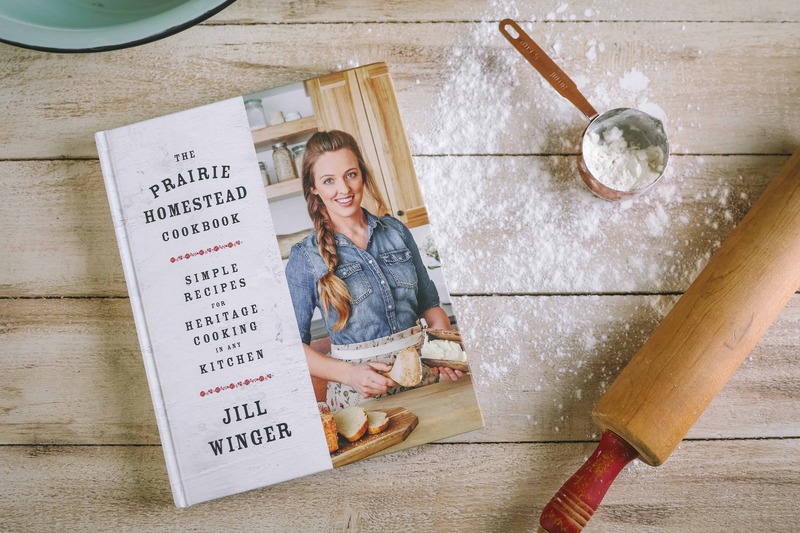 Jill, My grandparents had a dairy farm & I loved churning the butter & that tangy taste you just cant find in the grocery store. My question is this.If you are not using the mesophilic culture & were to opt for say yogurt, is there a certain type/brand like Dannon Greek or is there a type made just for this process. Second question. How much do you add? I’ve never used yogurt to culture my butter– if you’d rather not use the mesophilic culture, you could just let the cream ripen naturally. When making butter ij food processor, what speed should I run it at. I just made some butter this morning using cream and a good full fat sour cream it taste buttery and looks like butter, but it isn’t sweet or sour. Thanks for sharing this post on making butter I’m excited about making real sour cream butter. My husband had as a kid on the farm he grew up on. Do you think instead of starter culture I can use an acidophilus capsule? as that is how I make yogurt. Hmmm… I’ve never considered using acidophilus– not sure how that’d work! I have never made butter before but now I am going to try. But the starter culture (when I click your link) says it’s for cheese. Is it still fine for butter? I don’t know if there is a difference. I love homeade butter!! I get raw cream with my raw milk, it is pretty good now but phenomenal in the summer, What do you use for a ration for your milk cows in the winter. If you like here in SD there is no such thing as grass-fed in the heart of winter. So if I let my raw cream ripen for a day on counter will that constitute as cultured butter? you might try growing fodder in the winter. Jill, I finally got around to making butter today! I used raw cream at room temp, put it in my food processor, and let it run. I only used about 2 cups of cream (all I had), and I ended up with about 2 cups of buttermilk and a small log of butter. I wasn’t sure how long to let the food processor run – how long would you say yours does? Mine reached the “separation” stage, but I wasn’t sure if it had actually separated as much as it should have since I had quite of bit of liquid. That sounds about right! You’ll usually end up with a LOT of buttermilk after the process is done. As far as the time frame–it really depends on your machine, the temp of the cream, and the type of cream. But sounds like yours was perfect! It will keep for a week or two. The only way I know to keep it soft and spreadable is to leave it out on the counter. You might look into a “butter bell”. It’s an old-fashioned way to store it out of the fridge. You can make butter “Spreadable” by adding a small amount of oil. Make sure it’s a bland oil.. Non-EVOO, Vegetable oil.. etc. Depending on how spreadable you want it, up to a ratio of two part butter, one part oil (too soft for me, I like 4 to 1). What to do ? Whip room temp. butter until smooth, then slowly add oil. Jill, thanks for the info. I made my cultured butter in a kitchen aid stand mixer….warning to all…..when it goes from stiff peaks and starts to break…TURN THE MIXER DOWN TO LOW….or you will get whey/buttermilk splashed on the walls because it turns VERY quickly at that point. Wow–this is fascinating. Thanks Bill! Well, I am trying to make another batch and I just can’t get the cream to separate. I have a couple of cups of cream in the blender, and about 1 1/2 in the Cuisnart – both have been running for at least 20 mins and look almost like they did when poured. Maybe it is the cream I am using? This cream is raw, and I added a bit of the culture, then left it on the counter for 24 hrs. Should work, right? Thank you so much for this tutorial. I successfully made raw cream butter this afternoon using my food processor. So simple and much less expensive than buying it at the store. Thanks So Much for this! Today we had a food science lesson with my girls instead of earth science and they were thrilled to make butter! We are going to use it tomorrow on some more food science projects!! Which attachment do you use in your food processor? I’m guessing the plastic one rather than the one with the metal blades, but I wanted to check. Thanks for all the info! I just use the metal one for mine. Your link for the culture goes to a cheese culture. Is this what I am supposed to get? I Am having Trouble Finding Cream. All I Can Find Is Whipping Cream. It Works Fine For Making Butter But Wish I Could Find Raw Cream. Any Ideas ? Thanks for giving me the idea to do this today. I have always wanted to make my own honey butter but since you were so kind to post this decided to try this as written with heavy cream. I made a minor adjustment however and that was to use my food processor 1 pint at a time then after the final stage, drain the milk (saving it) and transferred it to the stand mixer and starting the second pint in the food processor, drain then add it to the stand mixer and then let it run for a spell. Can’t wait until sweetie gets home to try it. I had raw cream with a bit of culture sit on the counter for 24 hours. It turned into a yogurt texture and I put it in my food processor but it never turned into chunky butter :(. Did I do something wrong? It depends–but usually 5-10 minutes. I have some raw cream in the fridge that has soured. Can I still use it to make cultured butter? Yep! It just might be a little more “flavorful” depending on how sour it is. I have the same question. And boy was that cream hot when it left the blender. Mine was manufacturer’s cream that I cultured. So frustrating. Don’t know why it won’t break. Every once and a while that happens… It is frustrating. Do you use the flat/round food processor blade or the knife shaped one’s? My first attempt. I tried it in my Kitchenaid, but my metal beater attachment died a few weeks ago (moment of silence… carry on) so I tried using the other attachment. Didn’t work so I moved on to the blender. This looked like it might work, but only got to the chunky whipping cream stage and then when I tried to go longer it got really warm and is now back to the liquid stage. What can I use this for. Would it work like buttermilk in a recipe? Having searched for years to find the method of making the “Old fashioned Farm” sour cream butter, I think I’ve found the answer. Not for the delicate nose of many, it’s the smell and taste of Popcorn butter. Strong aroma and a little “bite” on the tongue. my big Problem? Unable to find a reliable source of Raw HEAVY cream, store bought pasteurized (not Ultra) was my only choice. After testing many cultures, with limited success, I stumbled on what seems to be the solution.. LIPASE. Pasteurization destroys the natural Lipase in milk. A very tiny pinch of lipase in a Flora Danica culture, and 48 hours later, A wonderfully strong Buttery aroma resulted. Churned, it resembled Grandma’s farm made butter. Of course, many won’t like the strong aroma and flavor, but I’m in heaven. Second hint: I’ve found that the OSTER TOP CHOP is the perfect churn for pint sized batches. Inexpensive, Quick, Completely closed container (no messy splashes), a snap to clean afterwards. Great tip Ralph! Thanks for sharing your findings with us! So i’m attempting to make the sweet butter (without culture) and it’s not working. It’s just staying in liquid form. What am I doing wrong? It’s been running for at least 30 mins. Thanks. usually 5-10 minutes, depending on the cream. Just curious on something…how do you manage to keep that wooden spoon so clean? When I rinse my butter, even with ice in the water, I have a greasy mess left on whatever I’m using to rinse the butter (be it my hands or a spoon, and the bowl.. It looks like your butter holds together very well. I’m not sure– I’ve always had it hold together fairly well– and even if it starts greasy, it gets firmer and pulls residue off the spoon. Does the butter come back if the cream was breaking but the blender got warm and it became liquid again? I tried making cultured butter today. It went really well, but I’m wondering if my cream was cultured enough when I started. I put a tablespoon of yogurt into a cup of heavy cream (vat pasturized, I believe) and let it sit overnight and half the day at room temperature. It smelled kinda like popcorn butter when I started making the butter. Does that sound right, or should it have been more sour smelling? Can you make this with an immersion blender of hand blender? I would love to make this with the raw milk I just bought! So delicious! I made the sweet cream version with my blender and the raw milk! Jill was right, it does make a LOT of buttermilk, probably about two to three quarters buttermilk. I will definitely make this again. Also about two pinches of salt is just perfect. You mentioned freezing the butter. How long does it last in the freezer? What do you use to freeze it? How do you thaw it? Sorry for all the questions..? Hey can you tell me what the process is if I want to use buttermilk as my culture medium? Thanks. Thanks for sharing this cultured butter making process.. 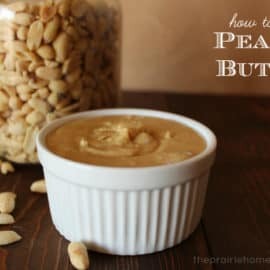 I like this post, but I am wondering if there is a way one can remove the smell from the butter. We are an inporting company in korea my name is Y.S.Yang. We’d like to import your milk butter products. If you have interest in exporting your milk butter products. to korea, please send your milk butter products. characteristics and specifications and your export price lists. If your milk butter products. are competitive in price and excellent in quality, we would import them. As you saw in our website, we are a food lighting company that sells not ordinary lights, but special ones to the shops of food like bakery, fruits, fish and meat. We have a 18-year experience in food lighting business. We import special lights for food from Germany and deliver them to food shops, supermarkets, department stores, bakery shops, butcher shops and so on here in Korea. This time one of our customers want to use saltless milky butter in making bakeries. So we are planning to import a large quantity of saltless milky butter and distribute them in Korea only if they are high in quality and good in price. At first, we’d like to know exact prices and purchase samples. We want saltless milky butter to smell good and be less yellow but more white in color. And we want that when eating the butter, its taste feels good in the throat rather just lingering in it. The food business in quite challenging. So we are carefully considering. In this opportunity, we’d like to do business cooperation with you if business terms are acceptable to both of us. My two year old and I just made butter for the first time using your directions. It was fun and I feel so accomplished! My dad likes to drink fresh buttermilk so he will have a special treat too! 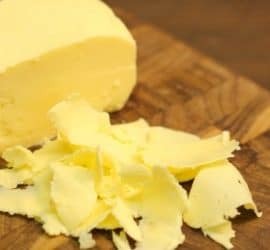 I just found your blog and read the post and replies about making butter. Several people asked why their cream would not break and turn into butter. Small appliances give off heat. If the cream gets too warm the butterfat melts and the cream will not break. The cream can get too warm if the kitchen is too warm, you are baking bread (hot oven) to use the new butter on (my usual problem), the blades cutting through the cream generate a small amount of heat but sometimes it is enough to cause the butterfat to refuse to separate. Good morning! I love your blog. I have a question for you. If a person does not have their own dairy cow how would they go about finding a source of raw milk to purchase? OMG! This recipe took me to heaven! I spent 10 years looking for an easy way to make butter. Now I finally can. I had no problem to follow the instructions and the butter turned out perfect. I wish I found it sooner. Thank you so much! Hi there! Last year I made our butter supply for the year in about 6 weeks (May-June) and it was upwards of 150lbs. It was the first time I had made butter and I don’t think that I was making it in the most efficient manner, I was using towels and squeezing it to remove the butter milk combined with some rinsing. Do you have any recommendations of a better way to quickly rinse and dry the butter to be more efficient with my time? Thanks for your time! It’s been awhile since I’ve had a source of raw milk. Im making butter tomorrow using a good ole fashioned churn. I have several machines that I could use, but I like churning. It’s very hands on and I love feeling the changes as the butter starts to form. This time I’ll be using my old crank churn, but husband is making a new wooden dasher( no nails, no glue) so my next batch will be made in my crock churn. Churning always reminds me of being a kid in Grandmas kitchen, churning her butter while she cooked. I looked at a lot of the comments and found no comment on the wonderful by-product that is buttermilk. A glass of cold buttermilk with a little black pepper on a hot day is well worth the butter making effort on its own. The unknown liquid byproduct of some process we may never know that is sold in the grocery store under the name buttermilk is most definitely false advertising. Thank you so much for this! It is so easy to follow and I’m on my way now to skimming off my cream for the raw milk. Yea!!!! Hi! I am having a hard time getting my cream to actually break. I set it out this morning (raw cream), and put it in my food processor this evening. I thickened up within a minute and then nothing. 30 minutes later and it still is a lotion consistency. I tried to it a few teaspoons of ice water in as it was processing but still no butter. Do you have any advice on what could be happening? If it’s a butter fail, do you have any recommendations on what I can use this thick creamy concoction? Thank you! We are currently getting just under a quart per milking from our cow, so if looking at a quart jar there’s just over an inch maybe an inch and a half of cream. Can I reserve the cream for a few days in the refrigerator and then leave it out to culture when we have enough to make butter? This may be a rather silly question, but we are new to this. Just tried the recipe and it was so easy!! Thank you for the tip about not using a stand mixer. I love my kitchen aid mixer too but I do NOT love cleaning things off the walls! I’ve tried a few of your recipes and adore them. Thank you so much for these! 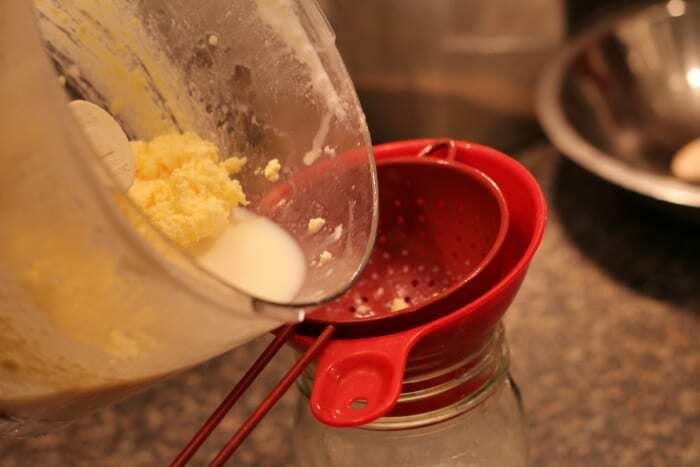 Have you ever made butter with raw goat milk? Would the process be the same? Great post by the way – thank you so much!